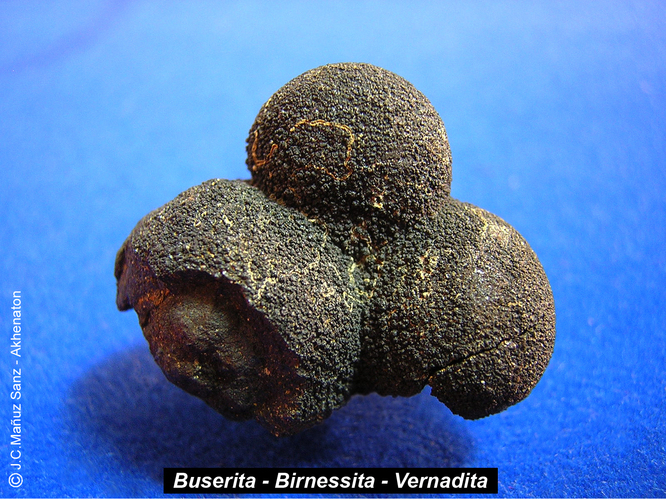 Birnessite: Mineral information, data and localities. Named in 1956 by Lloyd Hugh Parker Jones and Angela Alice Milne for the type locality at Birness, Scotland, UK. Earlier called "manganous manganite" by McMurdie (1944). Generally massive, either earthy or as a resinous to dull fine-grained deposit. Sometime is a replacing material of manganese minerals, including silicates. Occurs in some manganese oxide dendrites. Rarely as dark brown needle crystals. Compare 'UM1979-06-O:CaHMn' (reported as the Ca analogue, but structurally different). May mineralize fungal (Alternaria spp., Cladosporium spp.) hyphae, as known from a siderite boulder and from a soil (vide Burford et al., 2003). Parallel. Refractive indices not far from pyrochroite. The mineral is pseudo-uniaxial (-); an identification by optical properties is impossible. Rarely in platelets, to 50 µm; commonly extremely finely crystalline, spherulitic, cellular. Rarely as divergent sprays of acicular crystals. Birnessite frequently yields only 2-4 x-ray diffraction peaks. Data above recorded on a marine nodule from the Caribbean Sea; all reflections are typically very broad. See extensive d-value set ICDD 23-1046 (synthetic): 7.09 (100), 5.60 (10), 3.56 (80), 2.74 (10), 2.58 (10), 2.56 (10), 2.51 (70), 2.47 (10), 2.42 (60), 2.31 (10), 2.26 (10), 2.25 (10), 2.21 (40) 2.15 (40), 2.14 (40), 2.09 (10), 1.97 (10), 1.94 (10), 1.86 (40), 1.82 (40), 1.81 (40), 1.77 (20), 1.75 (10), 1.66 (20), 1.63 (20), 1.55 (10), 1.53 (10), 1.52 (10), 1.47 (60), 1.43 (50), 1.41 (40) 1.37 (20). Data from ICDD 13-105 and 18-802 have been superceded. Takanelite (Mn,Ca)Mn4O9 · H2O Hex. Manganese Oxides A review on these minerals has been published by Post (1999). Todorokite 51 photos of Birnessite associated with Todorokite on mindat.org. Romanèchite 49 photos of Birnessite associated with Romanèchite on mindat.org. Ranciéite 20 photos of Birnessite associated with Ranciéite on mindat.org. Calcite 10 photos of Birnessite associated with Calcite on mindat.org. Aegirine 9 photos of Birnessite associated with Aegirine on mindat.org. Serandite 8 photos of Birnessite associated with Serandite on mindat.org. Microcline 8 photos of Birnessite associated with Microcline on mindat.org. Kingsmountite 4 photos of Birnessite associated with Kingsmountite on mindat.org. Eudialyte Group 4 photos of Birnessite associated with Eudialyte Group on mindat.org. Leucophanite 4 photos of Birnessite associated with Leucophanite on mindat.org. McMurdie, H.F., Golovato, E. (1948) Study of the modifications of manganese dioxide. Journal of research of the National Bureau of Standards: 41: 589-600. Jones, L.H.P., Milne, A.A. (1956) Birnessite, a new manganese oxide mineral from Aberdeenshire, Scotland. Mineralogical Magazine: 31: 283-288. Brown, F.H., Pabst, A., Sawyer, D.L. (1971) Birnessite on colemanite at Boron, California. American Mineralogist: 56: 1057-1064. Glover, E.D. (1977) Characterization of a marine birnessite. American Mineralogist: 62: 278-285. Potter, R.M. and Rossman, G.R. (1979) The tetravalent manganese oxides: identification, hydration, and structural relationships by infrared spectroscopy. American Mineralogist: 64: 1199-1218. Chukhrov, F.V., Gorshkov, A.I., Rudnitskaya, E.S., Beresovskaya, V.V., and Sivtsov, A.V. (1980) Manganese minerals in clay: a review. Clays and Clay Minerals: 28: 346-453. Kim, S.J. (1980) Birnessite and rancieite problem: their crystal chemistry and new classification. Journal of the Geological Society of Korea: 16: 105-113. Burns, R.G., Burns, V.M., and Stockman, H. (1983) A review of the todorokite-buserite problem: Implications to the mineralogy of marine manganese nodules: American Mineralogist: 68: 972-980. Dunn, P.J., Fleischer, M., Francis, C.A., Langley, R.H., Kissin, S.A., Shigley, J.E., Vanko, D.A., and Zilczer, J.A. (1984) New mineral names. American Mineralogist: 69: 810-815. Golden, D.C., Dixon, J.B., and Chen, C.C. (1986) Ion exchange, thermal transformations, and oxidizing properties of birnessite. Clays and Clay Minerals: 34: 511-520. 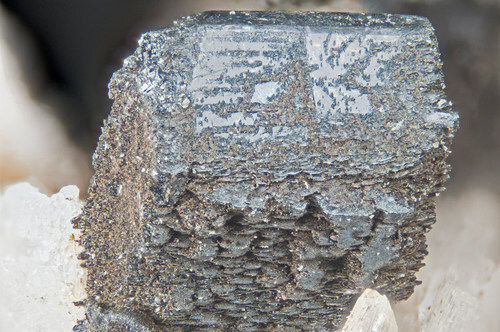 Golden, D.C., Chen, C.C., and Dixon, J.B. (1987) Transformation of birnessite to buserite, todorokite, and manganite under mild hydrothermal treatment. Clays and Clay Minerals: 35: 271-280. Post, J.E. and Veblen, D.R. (1990) Crystal structure determinations of synthetic sodium, magnesium and potassium birnessite using TEM and the Rietveld method. American Mineralogist: 75: 477-489. American Mineralogist (1990): 75: 477-489 (abstract). Manceau, A., Gorshkov, A.I., and Drits, V.A. (1992) Structural chemistry of Mn, Fe, Co, and Ni in manganese hydrous oxides: Part II. Information from EXAFS spectroscopy and electron and X-ray diffraction. American Mineralogist: 77: 1144-1157. Lanson, B., Drits, V.A., Silvester, E., and Manceau, A. (2000) Structure of H-exchanged hexagonal birnessite and its mechanism of formation from Na-rich monoclinic buserite at low pH. American Mineralogist: 85: 826-838. Lanson, B., Drits, V.A., Gaillot, A., Silvester, E., Plançon, A., and Manceau, A. (2002) Structure of the heavy-metal sorbed birnessite: Part I. Results from X-ray diffraction. American Mineralogist: 87: 1631-1645. Yang, D.S. and Wang, M.K. (2002) Syntheses and characterization of birnessite by oxidizing pyrochroite in alkaline conditions. Clays and Clay Minerals: 50: 63-69. Burford, E.P., Kierans, M., and Gadd, G.M. 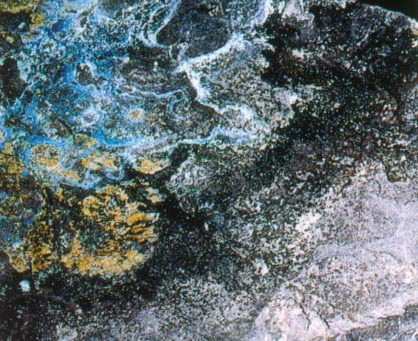 (2003) Geomycology: fungi in mineral substrata. Mycologist: 17(3): 98-107. Villalobos, M., Lanson, B., Manceau, A., Toner, B., and Sposito, G. (2006) Structural model for the biogenic Mn oxide produced by Psuedomonas putida. American Mineralogist: 91: 489-502. Johnson, E.A. and Post, J.E. (2006) Water in the interlayer region of birnessite: Importance in cation exchange and structural stability. American Mineralogist: 91: 609-618. Drits, V.A., Lanson, B., and Gaillot, A. (2007) Birnessite polytype systematics and identification by powder X-ray diffraction. American Mineralogist: 92: 771-788. Aldi, K.A., Cabana, J., Sideris, P.J., and Grey, C.P. (2012) Investigation of cation ordering in triclinic sodium birnessite via 23Na MAS NMR spectroscopy. American Mineralogist: 97: 883-889. Cygan, R.T., Post, J.E., Heaney, P.J., and Kubicki, J.D. (2012) Molecular models of birnessite and related hydrated layered minerals. American Mineralogist: 97: 1505-1514. Bridge, P.J., Pryce, M.W., Clarke, R.M., and Costello, M.B. (1978): Sampleite from Jingemia Cave, Western Australia. Mineralogical Magazine (September 1978 Vol. 42) pp 369-371. Schwertmann, U. et al 1987. Properties of iron oxides in relation to the environment of their formation. Clays and Clay Minerals Vol 35, No 4, 297-307. Berbain, C., Favreau, G. & Aymar, J. (2005): Mines et minéraux des Pyrénées-Orientales et des Corbières, Association Française de Microminéralogie Ed., 80. Held, U. und Günther, M.A. (1993) Geologie und Tektonik der Eisenerzlagerstätte Nothweiler am Westrand des Oberrheingrabens. Jber. Mitt. oberrhein. geol. Ver., N.F. 75, 197-215. Pantó, G. & Maksimović, Z. (2001): Two new rare earth minerals in an unusual mineralization of the Nissi bauxite deposit, Greece. Acta Geologica Hungarica 44, 81-93. Hein, J. R.; Stamatakis, M. G.; Dowling, J. S. (2000): Trace metal-rich Quaternary hydrothermal manganese oxide and barite deposit, Milos Island, Greece. Transactions of the Institution of Mining and Metallurgy, 109, B67-B76. Milési, J.P., Marcoux, E., Sitorus, T., Simandjuntak, M., Leroy, J., and Bailly, L. (1999): Mineralium Deposita 34, 131-149. Maletto, G., Piccoli G.C. (2014): Minerali in Val d’Ala. Associazione Amici del Museo "F. Eusebio" di Alba, Ed., Alba, 224 pp. + 1 folded map. Eckhardt, J.-D., Glasby, G. P., H. Puchelt, H., Berner, Z. (1997): Hydrothermal manganese crusts from Enarete and Palinuro seamounts in the Tyrrhenian Sea. Marine Georesources & Geotechnology, 15, 2, 175-208. Rossi P. L., Bocchi G., Lucchini F. (1980) A manganese deposit from the South Tyrrhenian region. Oceanologica Acta, 3:1, 107-113. Golubovskaya, E.V. (2003): Lithology and Mineral Resources 38(3), 275-281. Mee Burns, V., Burns, R.G. (1978) Authigenic todorokite and phillipsite inside deep-sea manganese nodules. American Mineralogist, 63, 827-831. Mata-Perelló,J.M. (1979).- "Las Mineralizaciones de manganeso de Estopiñan y de Natchá" Acta Geol. Hispánica, t. XIV (tomo homenaje al Dr., Luis Sole y Sabaris), 4p. Barcelona. Stalder, H. A., Wagner, A., Graeser, S. and Stuker, P. (1998): "Mineralienlexikon der Schweiz", Wepf (Basel), p. 409. Jones, L.H.P., Milne, A.A. (1956) Birnessite, a new manganese oxide mineral from Aberdeenshire, Scotland. Mineralogical Magazine: 31: 283-288. Embrey, P.G. (1978) Fourth supplementary list of British minerals. Mineralogical Magazine, vol. 42, n° 322, 169-177. Rocks & Minerals: 70(5): 320-333. Anthony, J.W., et al (1995), Mineralogy of Arizona, 3rd.ed. : 137. Anthony, J.W., et al (1995), Mineralogy of Arizona, 3rd.ed. : 398. Morgan, V. and Erd, R.C. (1969) Minerals of the Kramer borate district, California California Division of Mines and Geology Mineral Information Service: 22(9): 168; Pemberton, H. Earl (1983), Minerals of California; Van Nostrand Reinholt Press: 168 (photo 4-5). King & Foord, 1994. Mineralogy of Maine, p.63. ⓘ Betts Manganese Mines (Anson Betts Mine; Plainfield Manganese Mines) ? Kim, Soo Jin (1991). New characterization of takanelite (American Mineralogist, Volume 76, pages 1426-1430); "Western Massachusetts Mineral Localities" by Alan Plante, Valley Geology Press, 1992.
ⓘ Phillipsburg Manganese Occurrence ? Rocks & Minerals (Sept/Oct 1981). Frondel, et al: Am. Min. :45:871-875 (1960); Dunn(1995):Pt4:584.
ⓘ Point of Rocks Quarry ? ⓘ Dexter Quarry (Dexter Lime Quarry) ? Bowser, Carl J., E. Callender and Ronald Rossmann, 1970, "Electron Probe and X-ray Studies of Fresh Water Ferromaganese Nodules from Wisconsin and Michigan", Geol. Soc. Am. , Abstracts with Programs, vol. 2, part 7, p. 500-501.